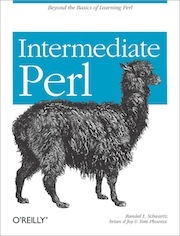 Intermediate Perl shows the basics of Perl testing. We show you how to write test programs and how to run those from the command line. That’s the language-specific stuff and within the scope of the book. You can take it further though. You can set up your code in a “continuous integration” system that runs the tests whenever you commit change (most of these trigger on a source control commit). You commit your code and grab some more coffee while your tests trigger themselves. Martin Fowler has some interesting thoughts on CI and wikipedia has a comparison matrix of CI services. I do a little bit more. Here’s one that I took from test-file repo, but you should check it for the latest version of whatever I’m doing. The perl key lets me specify which things I want to test. I leave off v5.8 because I also use Devel::Cover—that doesn’t work with v5.8. You can test with the versions that make sense for you (or leave this off and test with the latest version). I install some helpers. The install phase happens before the tests start. All of these commands run in the top directory of the repository. I use cpanm to install the dependencies (while skipping tests). I install the stuff I need to run Devel::Cover and to report its results to Coveralls to collect historical test data. The script section is the testing phase. The command comes from Devel::Cover. It deletes previous data (although this should be fresh) and then runs the tests.